So pissed off right now at Chevy for the service I received at not one but two different dealerships. First one Wouldn't touch my car. Second one made the car worse then it was before going into the shop for the Gas Tank Recall and Seat Belt Recall. They said that the reason the fule was leaking from my gas tank was because of the cap. So I had them buy a new cap and guess what still leaks. I take it they didn't get to the part of the test drive seeing I found this leak on the way home. To be honest, I don't know how it works if the tank has already been replaced. All I know is that they have to do it if it hasn't... I don't think the "never expires" applies to a leaky replacement, since it isn't the tank that was involved in the recall (I believe the recall is actually for the tank, not the car). Have you called GM and if so what did they say? I hate to think it, but you could be screwed here. If nothing else, Rock Auto has new Spectra tanks, baffled, for less than 2 bills. Replacing one isn't really hard to do, just time consuming and a PIA getting everything out of the way. One note forgot to make this isn't the second tank on the car this is the third tank from GM for this recall. Per District Manager they have to repair the car if the same problem comes to light after they did a recall repair even if it was years later. If the same problem stated in the recall happens they have to perform the repair at no cost even inspections to verify the repair." What makes yesterday even better than this video I posted is the first response I receive from the Sales Manager from this Dealership. That's the part I can't get across my head how the Sales manager acted. Now the service manager he had an attitude when I first arrived when I first drop the car off 10 days ago, but he didn't have one what so ever yesterday after the call to GM and posting the You Tube video. In fact he was short on words very to the point with no response to emotion. The Sales Manger had an red neck attitude I'm going to show you how I feel. I think the sales manager had more of an ego that got hurt that he had to show me how things really work and that I'm just some punk kid he can push around as he thinks fit. What ever his problem the only thing that made scene with him was that he said ("I would really like to tell you to get the **** out of here and never come back, but the risk is not worth the reward; because if you get into a wreck after you leave here or get hurt or the car catches on fire. I could lose my job and have criminal charges brought against me and the dealership.") Mind you the service adviser has been standing next to him this entire hour and a half ordeal that closely match the presidential debate last night on comments getting thrown back and fourth by me and the service manager. It would have been one thing to go there and have them bend over backwards be polite, because then this would have ended differently and would and could be passed off as a hudge mistake but they are willing to fix the problem. But to say they will look more into the problem, but no only the service adviser had this attitude which is the correct attitude in this situation which the service manager didn't have. The service manager had the response that his ego was too hurt and he had to show me or one up me. He even had to ask "...well are you going to take this video down off of you tube." My response "Do you job and I'll think about it." Mostly I think maybe the owner came down on the service manager hard on how this could have happen but in any situation, especially dealing in the customer service field you never get this kind of attitude no matter how mad or upset the customer is. Because you never know when you might be on the other side of the counter or worse have been recorded by the customer in full the entire conversation as I have done. Just now waiting for the right moment to post the second hour plus long video/audio recording to the internet, for Internet Justic 101. "If you were my kid I would have taken care of you my self if you pulled this move on anyone." That, my friend, sounds like a threat. Do you have that in writing? Can you take a screenshot, etc? I'd burn the sonofabitch over that. IE kiss your job goodbye. Anyway, keep fighting. Don't let them pull this crap on you. Writing lol who needs writing when I have it on Video lol that comment. I noticed this post.....but when inquired about it at my dealer, was told that there was no longer a recall out there on it. My tank isnt leaking near the filler tube, its leaking on the passenger side near the front side of the strap. I just had my tank replaced. If your car meets vin range, year range, model, and make it never expires and if leaking they have to replace. You will have to check out the spot its leaking. I'm not 100% sure but I think the recall only covers the leaking filler neck due to a poor solder joint..
Only the neck/tank joint is covered. If it is leaking anywhere else it is not a covered problem. The recall order is VERY specific about that. Your dealer is wrong however. Once a safety recall (SAFETY recall, not a TSB or standard recall) goes into effect, it never expires... time, mileage, ownership, condition don't matter. Bringing a crapper car in 20 years later will raise eyebrows of course, but by law they still have to do it. You can go to 'safercars.gov' and pull up the recall notice. Says right in the notice 'regardless of age, mileage, or ownership'. hmm, my fuel guage does not work at all. its a 91 rs.. do you think taking it in would fix the problem? Is this recall only for the 91? I checked safercar.org for 92 camaro and this came up. Or is it a typo? I think this is why the recall was brought on, lol. Not too good as you can see. I wonder if I can get this swapped under the recall as my cars VIN falls under it. Only problem is I'm doing the labor myself as I was going in to the tank for a fuel pressure issue. I'll prolly get turned down because of this but I'm gonna try. Isn't there shops that repair tanks as well? I'm gonna have to check around on that as an option if I can't get it warrantied... or plan C is to purchase a new one. So, I just had our 91 Z28 towed to my favorite independent shop when we couldn't get it to start Thursday night. After a quick check, it was determined that the fuel pump was bad. After dropping the Flowmaster exhaust and starting to remove the tank, the mechanic called to tell me that the tank had pinholes and would have to be replaced. I'm not sure if the pinholes are in the tank itself or where the filler neck joins the tank. Does anyone know if this will this make a difference on the recall? I have noticed the smell of gas near the rear of the car when it's parked in the garage. I found a tank from an 86 Camaro at a wrecking yard 60 miles away, but went online to try to find out if the 86 tank would work on our 91. Does anyone know if it will? While looking for part numbers, I found this thread about the tank recall. Now I just want the mechanic to put it all together the way it is, and I'll get the car towed to my local GM dealer to get the tank replaced under the recall. I haven't talked to the dealer yet since it's Saturday. I'll keep you posted on the results. I just called GM today, and they told me the recall was expired. I then called the NHTSA, and they also told me it expired in 2004 (after 10 years). I need to get the car fixed soon. It's sitting in the shop with no tank. If anyone has names of the people who honored your recall, or has an official document saying that the recall never expires, please tell me how to find them. I can't find anything online showing it expires or it doesn't. You can reply here or call me if you can help. I'm having a hell of a time getting a dealership to touch this recall. Two dealers both have told me the recall is still active, but that they can't find a campaign number or something like that, which I'm guessing is how they get reimbursed for the part/labor. Its pretty bad though, If I have more than a 3/4 tank, gas literally comes spewing out the top of the filler neck and all down my paint! Don't know what to do now, this is ridiculous. Find a good tank from a 91-92 in a JYard, it has the plastic baffle like your car does now. It helps prevent fuel starvation in corners with low fuel levels. The recall doesn't cover rust holes. Its a recall within a certian VIN range of camaro and firbirds due to a bad solder joint on the neck. Find out where your problem is. Ravagetheroad... If the fuel is coming out of the top of the neck at the cap you need a new cap, maybe a tank neck if yours wont seal. Maybe you have the wrong cap on the car? Last edited by TTOP350; 12-12-2012 at 01:53 PM. That a Safety recall never expires. Also do not be afraid to call GM directly!! Sounds like he does... besides which, if fuel is coming out the top side of the neck it isn't a recall issue. The recall only effects leaking around the neck-tank joint. yes my camaro leaks gasoline i noticed last week when i topd it off. iwas going to order new tank. so you are telling me if i go to gm dealer they will replace for FREE! mine only smells. the only time it leaked was when i topped it off it started dripping gasoline. so i only fill it 3/4..does that mean its by the neck conecting the tank?? I'm in a similar situation. I dropped my tank to swap out the pump and found the crack. Do you know if yours is leaking or are you just checking to see if it is problamatic? I talked to the dealer on Thurs, and after they researched for a bit they got back to me with "the tank is discontinued and we don't know what to do." I'm waiting for them to call me back this week with a solution hopefully. i smell gas when i get out of mines, but sometimes the smell is really pungent. just hoping to get rid of the smell and maybe save a few mpg's at the sametime. I haven't had any success either. The dealer that I was working with was willing to fulfill the recall on my car after I gave them the campaign number, but since they can't get any new fuel tanks then I tried calling the Chevrolet customer service number to see what is the next step. After talking to the represantative there they said that there is no recall under my VIN other than a seat belt and their system can't be wrong. So I called the NHTSA filed a safety complaint and hopefully something happens but from the sound of it if something happens it will only be after more complaints come in and months of investigation. All the numbers that I called were off of the recall notifications that we have links to on the first post. I should complain to the NHTSA as well, whats there # lol matter of fact everyone in this thread should call we are a big group here. I too have been wondering about this recall. Is it even still valid lately? I have an '89 Firebird that appears to have this problem. Since I've owned it, if I fill it all the way up, it seeps gas and smells like gas. Also, there is no gas tank pressure and I can move the filler neck back and forth a little, not much, but it definitely has a loose feeling. I just don't fill it all the way up right now. I'm in no mood to drop the tank unless I have to change the pump and if I have to do it, I'm putting in all new parts including a new gas tank. What are the odds I can get GM to fix it these days? Slim to none? Also is not having fuel tank pressure a problem? I've got an 89 Camaro with the same symptoms you're describing. It would be nice to beable to completly delet posts..
Last edited by TTOP350; 05-02-2013 at 10:37 PM. Check the following link, which includes the info below. "Yes. There is a limitation based on the age of the vehicle. In order to be eligible for a free remedy, the vehicle cannot be more than 10 years old on the date the defect or noncompliance is determined. Under the law, the age of the vehicle is calculated from the date of sale to the first purchaser. For example, if a defect is found in 2003 and a recall ordered, manufacturers are required to make the correction available at no charge only for vehicles purchased new in 1994 through 2003. However, consumers should realize that even though manufacturers are not obligated to remedy safety defects in older cars, a safety problem might still exist. If you receive notification of a defect on a vehicle older than 10 years, take the responsibility to have your car repaired at your own expense – and eliminate unnecessary safety risks. "Also, if the manufacturer challenges the agency’s final decision of a safety defect, there is no obligation for the manufacturer to remedy the defect while the case is in court. If you decide to have your vehicle remedied at your own expense while the case is pending and the court upholds NHTSA’s final decision, you may be entitled to reimbursement. (Be sure to save all receipts and paperwork so that you can prove the repairs were made.) However, if the court ultimately rules the defect is not safety related, Federal law does not require that the manufacturer reimburse you for the repair work." That's kind of what I figured. I guess I'll be fixing it myself out of pocket. It's a shame that they changed anything when it comes to the gas tank. I mean my '82 Trans Am doesn't have this problem and neither did the 3 '84s I had. What idiot decided to change something I wonder and how did they get away with it? Lastly, this thread shouldn't even be open anymore. Most of the links are broken and the information is WAY out of date. After calling my local GM dealer, it's obvious that this recall no longer applies and we are on our own. dealers and the NHTSA/DOT not to mention that I was insulted and called a liar and a idiot by a couple of a-holes that have posted on this and the seatbelt thread. I believe the tank neck solder joint was a result of another epa mandated lead reduction in the solder and that lead to the cracking problem. Since your pulling your tank for a new walbro fuelpump anyway, take the empty tank to a old school radiator shop and have them psi test it, resolder the neck if needed and PSI test it again. That may cost you 10-20-50 bux and your time. Just so you all know. 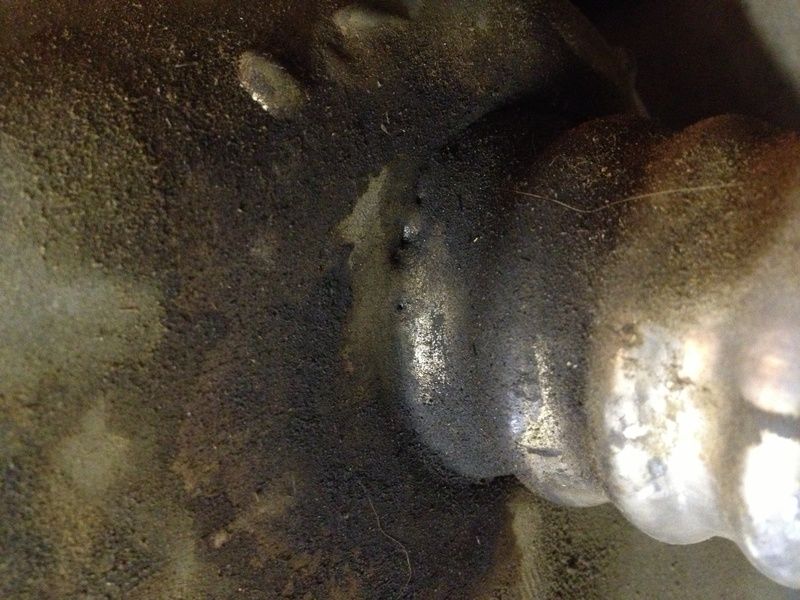 Having a broken filler neck and loosing pressure in the gas tank can cause CODE 32 or egr failure on our F-bodies which many people are getting. If your cap is new and you dont hear gas pressure when you slowly open your gas cap then you most likely have a bad cap or hole somewhere in the tank or runnig to the canister. Which if you have to do the new EVAP test which we have in california you will fail the smog test. The evap testing checks for and measures the pressure in the gas tank,they pintch off the line to the canister, to much loss of pressure and you fail. I have read some people replacing the egr, egr selinoid vacum lines ect and still get code 32 on the freeway, replace the tank and this should fix it. Is this still in affect ? Incorrect recalls are valid for life. Only and the only time they are not responsible is if the car or truck was over ten years of age when the recall was issued. This tank recall was issued on the third gen's when none of them were over ten. It even says this within the recall and on NHTSA website. Look it up before giving wrong info. It's even within this form that provides and references this. This goes for all safety recalls. Yes. There is a limitation based on the age of the vehicle. In order to be eligible for a free remedy, the vehicle cannot be more than 10 years old on the date the defect or noncompliance is determined. The noncompliance was in 1992 so since none of the cars in the recall were ten yet the recall is valid for life. I called about my 92 rs. Was told without any look up by two dealers that my car has no recall. I told them most Camaro sites say it still IS in effect. They basically told me to **** off. Anyone know a good Chevy dealership around mass/ Rhode island? Cerrone or desantis are the ones that said no recall ever for my car.. I'll help get the ball rolling. No wonder I can't never make it past the 2nd gas station. Great info! I would rather replace it myself instead of going through what half you guys are going on about. But thanks for the Info on the tanks Mine may be one of the recall ones Im just gonna go check mine out for myself tomorrow. Ive never seen a leak yet and i had it out looked like a new tank when i pulled it. We are getting ready to replace the tank on our 86 TA for the same issue. The tank leaks gas around the base of the filler neck if filled full. The car smells like raw gas around the fuel tank area when driven, and the tank is not building any pressure. The car is like new with 30K actual miles on it. This must have been a common problem for lots of thirdgen's. I am going with a Dorman replacement tank from Summit, and will be replacing the fuel pump just to ward off evil spirits. The last thing I need is an unsafe car. Our grandchildren and other family members ride in this thing. Having two old low mileage TA's to tinker with is loads of fun, however they need to be as safe as possible. Does anyone know this is also valid in overseas?